The strong quarterly and annual growth comes after a weak 2009, which saw the market decline by 1.6%. According to IDC, a stronger economy and a wider array of increasingly affordable smartphones helped lift the market to its highest annual growth rate since 2006 when it grew 22.6%. "The mobile phone market has the wind behind its sails," said Kevin Restivo, senior research analyst with IDC’s Worldwide Mobile Phone Tracker. "Mobile phone users are eager to swap out older devices for ones that handle data as well as voice, which is driving growth and replacement cycles." He noted that it’s not just smartphone-focused suppliers that capitalized on the mobile phone market’s renewed growth last year. ZTE, a company that sells primarily lower-cost feature phones in emerging markets, moved into the number 4 position worldwide in 4Q10. It is the first quarter the Chinese handset maker finished among IDC’s Top 5 vendors. "Change-up among the number four and five vendors could be a regular occurrence this year," added Ramon Llamas, senior research analyst with IDC’s Mobile Devices Technology and Trends team. "Motorola, Research In Motion, and Sony Ericsson, all vendors with a tight focus on the fast-growing smartphone market who had ranked among the top five worldwide vendors during 2010 are well within striking distance to move back into the top five list." IDC believes the worldwide mobile phone market will be driven largely by smartphone growth through the end of 2014. "Feature phone users looking to do more with their devices will flock to smartphones in the years to come," noted Restivo. "This trend will help drive smartphone sub-market to grow 43.7% year over year in 2011." * The Asia/Pacific mobile phone landscape was driven by low-cost and high-end devices in 4Q10. Domestic brands in India like G-Five, Micromax, and Karbonn grew with aggressive advertising and branding activities for entry-level phones, while ZTE and Huawei worked closely with carriers to push low-cost Android smartphones in China. High-end smartphones, however, were equally well-received, resulting in higher shipments from Apple, Samsung, and HTC in 4Q10. Korea had the biggest smartphone appetite accounting for two-thirds of phones shipped in 4Q10, up from one-eighth a year ago. * In Western Europe, carrier smartphone promotions motivated more users to scrap their feature phones, resulting in strong smartphone sales. 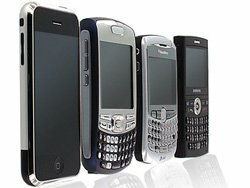 The iPhone 4, HTC Desire, Nokia N8, Samsung Galaxy S, and Blackberry 8520, which were among the region’s top sellers, contributed to the overall market’s growth. Consequently, the feature phones experienced their sharpest decline ever. In CEMA, quarterly volumes breached the 70 million unit threshold for the first time, marked by an influx of Chinese and unbranded handsets. Meanwhile, smartphones experienced brisk growth due to falling prices and more Android-powered devices. * The United States mobile phone market closed out the year with more vendors becoming more active in this space. Market leaders RIM and Apple maintained a healthy lead, while newcomers Dell, Huawei, Kyocera, and Sanyo launched their first smartphones to the U.S. market. In addition, 4G took another step forward with the commercial launch of Verizon Wireless’ LTE network. Similarly, in Canada, the focus was on smartphones. Android-powered devices from multiple players, along with incumbent vendors RIM and Apple, pushed shipment volumes to a new record level. * In Latin America, sustained user interest in smartphones drove the market, resulting in strong results for Nokia, RIM, and Samsung as well as relative newcomer Huawei. Smartphones, as well as QWERTY-enabled feature phones, helped boost social networking and messaging, two fast-growing trends in the market. Finally, Alcatel and ZTE once again thrived in the inexpensive entry-level device market. Samsung reached a new milestone in 4Q10, pushing through the 80 million unit threshold for the first time in the company’s history and improving its profit margins for the second straight quarter. Driving shipment volumes was the continued success of its Galaxy S smartphones, of which the company sold nearly ten million units worldwide for the year. Similarly, Samsung’s mass-market and touch-screen phones earned a strong following in emerging markets. LG crossed the 30 million unit mark for the quarter, due in part to the success of Optimus One smartphone sales across multiple regions. LG’s smartphone strategy is paying off; the company sold more than a million units in the first month of availability, and newer versions (Optimus 2X, Optimus Black) are expected later this year. Meanwhile, LG’s feature phones comprised the majority of shipments, but an aging portfolio and lower prices within emerging markets left the company vulnerable to the competition. ZTE finished the quarter in the number four position with shipments steadily spreading from its home country of China to developing regions such as Africa and Latin America. ZTE has also recently made inroads in developed markets such as Western Europe and the U.S. as well as Japan. While most of its shipments have historically concentrated on entry-level and mid-range devices, some of its recent success is directly attributable to its rapidly expanding smartphone line, such as the Android-based Blade and Racer devices. Meanwhile, its S- and C-series entry-level feature phones provided additional competition within emerging markets. Apple The iPhone maker slipped to the number 5 position despite a record quarter for unit shipments and the departure soon thereafter of CEO Steve Jobs on medical leave. It was the company’s second straight quarter on IDC’s Top 5 list. The iPhone sold particularly well in developed regions of the world, such as North America and Western Europe. Apple, which said it could have sold more iPhones last quarter had it been able to make more, is set to introduce the touchscreen device on Verizon next month.